What is the color neon pink and what matching colors you can wear with it? This is a bright, flashy shade that can be used successfully in the attention-grabbing color combos. light blue (to cool and impress). Such a glamorous shade is for the brave! It seems to be completely girlish but sure enough it can be used by a young man to reveal his unruly vital power and bright personality. 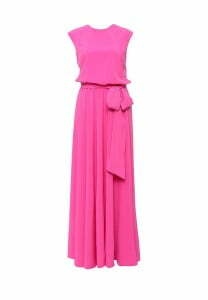 You will certainly stand out in the crowd wearing even one small detail of neon pink. Still it is better not to overuse it and escape matches reminding traffic light. Remember, that by this color you attract attention right to the zone where it is applied. Pair it with softer hues so that you could make it delicate but not rude. For example, a neon pink blouse is nicely combined with complementary blue jeans. Such acid tone is preferred in summer and more often for casual looks. It is good for those, who have pale face and light hair. Deciding what color goes with neon pink suits you best of all, do not forget about the occasion and surroundings. Neon pink cigarette pants with leather T-shirt and sky blue pumps. Romantic and cute image.